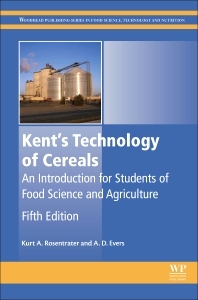 Kent’s Technology of Cereals: An Introduction for Students of Food Science and Agriculture, Fifth Edition, is a classic and well-established book that continues to provide students, researchers and practitioners with an authoritative and comprehensive study of cereal technology. This new edition has been thoroughly updated with new sections, including extrusion cooking and the use of cereals for animal feed. In addition, it offers information on statistics, new products, the impact of climate changes and genetics, new economic trends, nutrition regulations and new technologies. The book is useful for students, researchers, and industrial practitioners alike, covering the full spectrum of cereal grain production, processing, and use for foods, feeds, fuels, industrial materials, and other uses. Dr. Kurt Rosentrater is an Associate Professor in the Departments of Agricultural and Biosystems Engineering as well as Food Science and Human Nutrition at Iowa State University. He also serves as Executive Director of the Distillers Grains Technology Council, which is an organization focused on education and outreach to improve the use of beverage and fuel alcohol coproducts in animal feeds. He is actively pursuing a research program to improve the sustainability of the grain-based alcohol industry. His research is focused on developing processes to add value to, and more effectively utilize cereal-based fermentation coproducts. He is developing sustainable, economical materials and products from distillers grains, such as enhanced feeds, foods, bioplastics, biocomposites, industrial intermediates, additional biofuels, and bioenergy. Over the last several years, his work has helped advance the capabilities of ethanol plants to produce, transport, store, and utilize coproducts, which has led to improved utility for livestock producers and increased economic values for ethanol manufacturers. His expertise is in value-added coproduct development, alternative recycling and reprocessing strategies for biofuel coproduct streams, improvements in processing efficiencies, life cycle assessment, techno-economic analysis, modeling and simulation of processing systems, plant layout, and process design. He attended Iowa State University where he received his BS, MS, and PhD in Agricultural and Biosystems Engineering. He is a member of the American Society of Agricultural and Biological Engineers, the American Association of Cereal Chemists, the Institute of Food Technologists, the American Society for Engineering Education, the American Physical Society, and Sigma Xi Honorary Research Society. Tony Evers obtained his BSc degree from University of London as an external candidate in 1967. He followed this by gaining an external MSc through submitting a thesis on ‘The Development of the Endosperm of Wheat’ in 1969. During his studies for both degrees he was working under the direction of Dr Norman Kent at Research Association of British Flour Millers. Evers continued to work for the same organisation until it was incorporated into the newly formed Flour Milling and Baking Research Association (FMBRA) at Chorleywood. A further amalgamation resulted in the creation of Campden and Chorleywood Food Research Association (CCFRA) at which Evers was appointed Head of Cereals and Milling Department. In addition to publishing in refereed journals, and contributing to international conferences, Evers contributed to chapters in Food Microscopy (Academic Press, 1979), Wheat Chemistry and Technology (American Association of Cereal Chemists, 3rd Edition, 1988 and 4th Edition, 2009) and Encyclopedia of Seeds (CABI, 2006). At the invitation of the senior author, Evers became co-author of Kent’s Technology of Cereals (4th Edition, Pergamon, 1994).